Scottish Football Museum showcases the rich football heritage of Scotland. Fitting of it's location at Hampden Park Stadium, the origins of football are often credited to Scotland itself and it's premier national cup competition- the coveted Scottish Cup, the oldest club competition in world football. Enjoy the museum’s memorabilia collection, Hall of Fame and exciting stadium tour. The Museum is built on the recently rebuilt Hampden park on the south side of Glasgow, the home of the Scottish national football team and the oldest stadium in the world today, known for the deafening 'Hampden roar'. The museum boasts an impressive display of over 2000 objects and 14 galleries of interesting football memorabilia. Amongst the items on display are the match ticket to the first international football match from 1872 and the world's oldest international trophy; the Scottish Football Association Challenge Cup, made in 1873. The museum travels through a timeline of the most remarkable moments on Scottish football, with the Clyde 1 'Super Scoreboard Showcase' celebrating 30 years on the radio commentary of our beloved game and displays of black and white photographs from the world renowned Tim Hall. Visitors are encouraged try their luck at the museum's computer-simulated football machine, where they can try their hand at scoring a goal at the world famous Hampden Park. The power and speed of your shot will be measured and recorded and the top 100 will be registered on the Scottish Football Museums official website, allowing visitors a slice of fame and the chance to measure their efforts against others from around the globe. 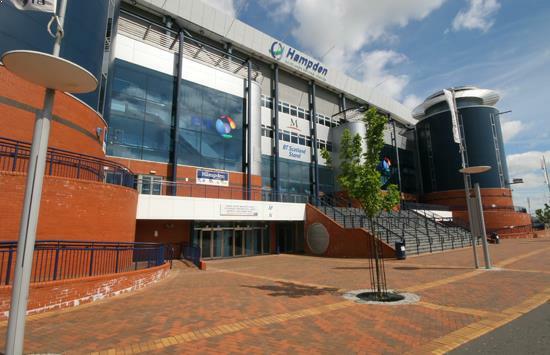 Visitors are also offered a tour of the stadium itself, from the tunnel where players nervously anticipated as the cup final loomed, the changing rooms were passionate half time team talks turned games on their heads and the pitch itself were the biggest stars in world club and international football have exhibited their talent and knees trembled as they felt the heart stopping 'Hampden roar'. The Museum was also the first in Glasgow to be awarded the prestigious Five Star stamp of approval from VisitScotland making it one of the top visitor attractions in Scotland.